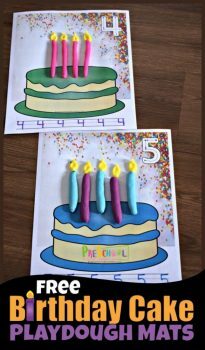 Beth at Preschool Play & Learn has created a lovely set of Birthday Cake Playdough Mats for counting! This resource is for counting from 1-10. Each page has an empty birthday cake in need of playdough candles! There is also a traceable number at the top right corner. Your child will need to trace the number and then create the corresponding number of birthday candles from playdough! Get your Birthday Cake Playdough Counting Mats here!